While I look forward to this time of year with the snow melting and sun shining, I also dread it because I know my skin will become more oily. I was so excited when I discovered a couple Colorescience products that have not only worked wonders for my oily skin, but also helped me wear less product and speed up my makeup routine. I just had to share! 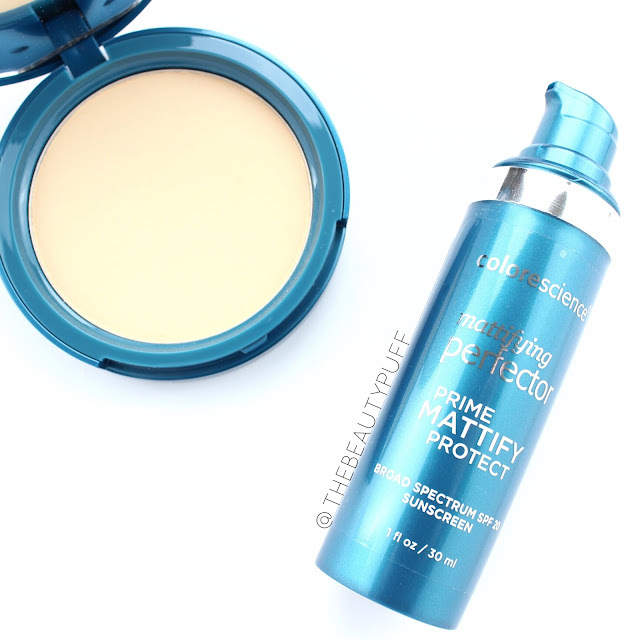 Skin Mattifying Perfector | A primer can really make or break your look. I have to be really particular with my primers because my skin is so oily. The Colorescience Skin Mattifying Perfector has a mousse-like texture that doesn't slip all over the skin. It stays in place and really works to keep oil at bay. It is tinted so it evens out my skintone and can be used on its own for a natural, matte finish. I even noticed considerably less oil around my nose which is huge considering that's my biggest trouble spot. Less oil means longer lasting makeup. Yes, please! Key ingredients include: Salicylic acid, oat beta glucan and hydrolyzed rice protein. Natural Finish Pressed Foundation | As much as I love the look of a flawless liquid foundation, I can't resist the ease and natural look of a powder foundation. The Colorescience Natural Finish Pressed Foundation has a smooth, natural finish that keeps skin hydrated and looking fresh all day. It comes in six versatile shades and has SPF 20. I have the shade Light Ivory which works seamlessly with my light, neutral toned skin. I can wear it on its own because it has great coverage and it feels like nothing on my skin. I haven't worn any spot concealer because I like the light, buildable coverage of this powder. If I have any stubborn redness, I just use a stippling motion and that does the trick. It's such a versatile powder and makes getting ready a breeze! Finding the right combination of primer and foundation can bring your look to a whole new level. Not only do I love the Colorescience Skin Mattifying Perfector and Natural Finish Pressed Foundation on their own, but together they are like a magic potion for my oily skin. My skin looks smoother, shine is reduced, and I don't have to use too many products to keep it looking that way. Shop below and explore the entire Colorescience collection.